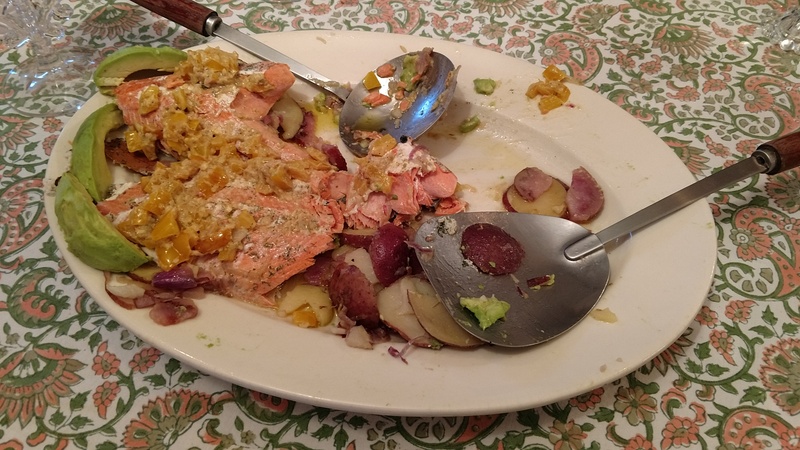 We had promised a close friend a salmon dinner. So, I thought, we could just bake or broil the salmon, in this case, fillets, in butter. But, why not give it that extra oomph with a ginger-mustard sauce? This is a recipe that I came across years ago, and I can’t remember where. 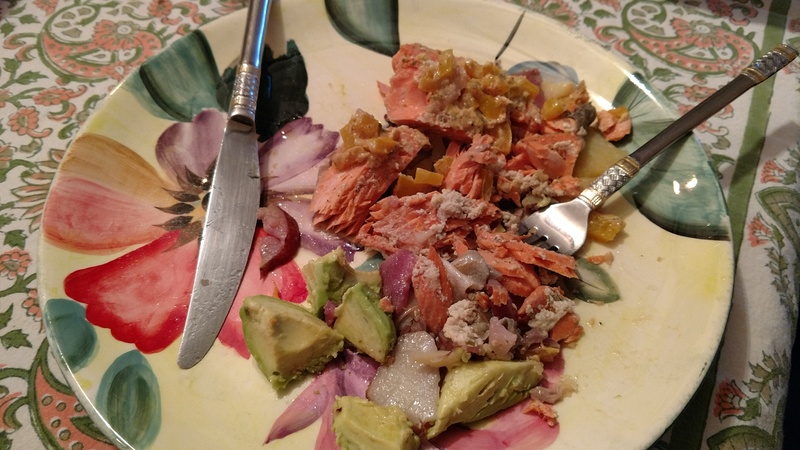 But it does liven up the mild, nuanced flavor of salmon without overwhelming it. In the recipe given, fish fillets are the normal ingredient. When I did it, I used two a whole, wild sockeye salmon fillets that weighed about a one pound each. You can go that route, or for four servings, you can use four boneless salmon fillets It depends on what’s available in your store. The recipe is unique in that the salmon is not baked or broiled, but poached in water resplendent with dill and other herbs. Then you prepare a ginger/mustard sauce, and serve it with the salmon. Nothing could simpler, or more delicious. Place salmon fillets in a saucepan with water to cover. Add dill, bay leaf, cloves, peppercorns, and vinegar. Bring water to a boil and simmer for 3 minutes. The center of the fillets can be underdone. Some like it this way. If not, then cook 2 minutes longer. Drain and serve with the ginger-mustard sauce. In a bowl, mix mustard, ginger, shallots, garlic, vinegar, pimentos and pepper. Blend well with a wire whisk. Add olive oil, whisking rapidly until well blended.